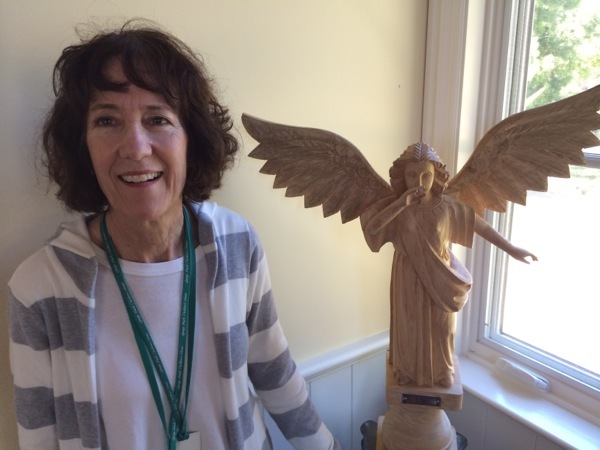 Kathleen with angel in the sanctuary at George Mark Children’s House. Editor’s Note: Serving the Story’s community service road trip continues in the San Francisco Bay area. The names of the children mentioned below have been changed to protect privacy. Autobot – “Optimus Prime,” she interjects for my benefit – gave a speech at movie’s end about a brave Autobot who had died in battle, I was so confused, I didn’t even know it had happened. She tries to help me out, speaking in emphatic and rhythmic bursts, with plenty of opinion thrown in for good measure. In other words, a natural comedian. She explains how when it comes to picking out evil robots, if someone has “airplane wings sticking out of the sides of their head,” well, that’s a pretty good indication. The hallway in which we sit is as quiet as a Michael Bay movie is loud. Plenty of light splashes through the windows of the George Mark Children’s House, which feels not only homey, but somehow better than home. Spacious rooms, playful animal statues, toys and games for children of every developmental level. My favorite room is Great Vibes, in which kids can play with lights, colors and vibrations in ways I can’t even describe here – except to say it’s like every children’s interactive exhibit I’ve seen in any museum, all in one cozy room. 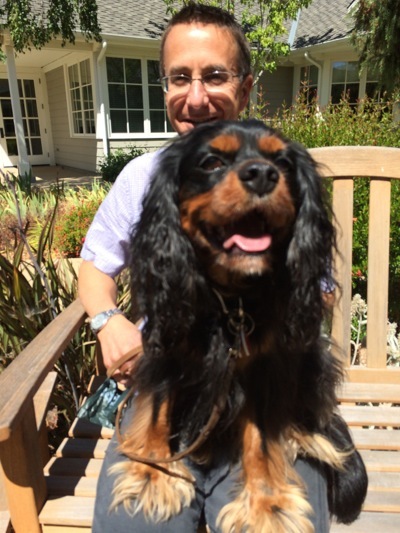 There’s even Max, a black and tan King Charles Spaniel who comes waggling up with his master, Jeff Simon. As she pets him, she complains about not having a dog – but not for the reasons of most youth. Max and master Jeff take break from rounds at George Mark Children’s House. This positive turn is characteristic of everyone I see at George Mark, and it doesn’t come off as a fake glossing over of the very real struggles of severely ill children and their families. Indeed, it’s the very challenges faced by families that makes the work at George Mark Children’s House so meaningful. I believe her, just as I believe Ken Sommer, who had joined us for our morning talk. The director of advancement for George Mark, has worked in some challenging non-profits. An aspiring rock promoter who intead wound up in the arts, he eventually sought the gravity of the San Francisco Tenderloin district, working for both Glide Memorial Methodist– where I volunteered yesterday – and Tenderloin Development Corporation, which worked to house the homeless. Yet, strangely, typically only five of eight beds at George Mark are full. Ken suspects that this is partly due to misconception: The organization is thought of as a hospice for children, when “end of life” is only one of three kinds of service it provides. The house also offers “transitional care” – helping families adapt to their new medical circumstances after a hospital stay – and “respite care” – simply taking in an ill child to give families a much-needed break. What the children in every category have in common is a “life-limiting” illness – but that life might still take someone into their early 20s before passing. Thus, there are children, and families, who are in and out of George Mark for many years; even after the child’s passing, families often return for remembrance celebrations and other events. But there are limits. For the 55-65 volunteers who put in weekly four-hour shifts interacting with the children, boundaries are important. As much as families might press for personal contact information or even such routine self-disclosure as showing pictures of their own kids, volunteers have to limit their contact to their hours at the house. But within those four hours, volunteers pay close attention to the needs of both patient and family. Becky introduces me to one of those volunteers, Kathleen Phillips, as she sits talking with Anna in the hallway. I get to shadow her for much of her shift. In her first career, Kathleen wasn’t a nurse – in fact, she was the vice president of finance for the Oakland A’s. She left that job to raise kids. Once her children hit their teenage years, though, Kathleen told a friend, Kathy Nicholson Hull, that she’d like to start volunteering somewhere. Becky Randall was a veteran volunteer before she became volunteer manager. It turned out Hull, a clinical psychologist, was partnering with pediatric oncologist Barbara Beach to start George Mark. The house would be named for Hull’s brothers – George had died at age 30, Mark at age 16. It would be nine months before George Mark opened its doors in March, 2004 – making Kathleen one of the first volunteers. 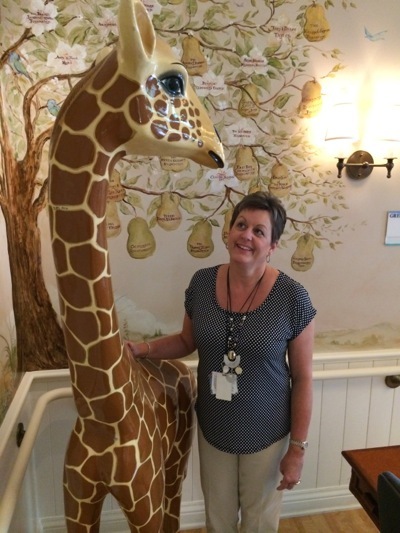 In the decade since, Kathleen has spent time with “hundreds” of patients. Each shift she carefully reviews the file on the child; diagnoses are not included, but scores of other key pieces of information are, right down to what things they seem to enjoy. Many are nonverbal, and might have very limited use of their limbs. Kathleen might use hand-over-hand techniques. For instance, placing her hand over the child’s, she and the child can draw a picture together even if the child cannot move the pen on his or her own. Even when a child is restricted to a bed, the bed can be rolled into the patio and garden so he or she can enjoy some fresh air. As we converse, Kathleen is gently pushing a dark-haired boy in a wheelchair from room to room; his head lolls back against a head brace, he doesn’t speak, and I never catch his eyes engaging my own, but those eyes stay open, and he sometimes emits a long low laugh. When he does, Kathleen gently talks with him. Other times, they may just sit quietly together. Much of the training is about specific techniques; there is also a lot of role playing, acting out particular scenarios. Some concerns how to be helpful with the siblings – and what to say, or not say, to them. Kathleen remembers one girl who others said seemed determined not to talk; she simply sat and watched TV. But when Kathleen visited with her, the child opened up. “She said she felt really guilty because she’d rather be in school than here, but she didn’t want to say that, because she didn’t want her parents to think she was a really bad person, or for her brother to think she was a really bad person. In addition to such shrewd listening ability, what qualities are cultivated in a George Mark volunteer? “Patience,” Kathleen tells me. “Life outside here with you own kids is like ‘come on, let’s get this done, let’s do that done.’ Here it’s a much different pace. It takes someone who has compassion – and someone who has a sense of humor. [Anna’s] funny; she’s kind of boy crazy, so she can say some really funny things. Meanwhile, the very gravity of the situations faced by families make volunteers feel glad to have helped them. Ken tells of a child with cystic fibrosis who’d spent 48 of 52 weeks in intensive care before coming to George Mark – where he surprised his doctors by recovering enough to be eligible for a lung transplant. He received that transplant, and even though he still has cystic fibrosis, he’s this “18-year-old dude” who spoke at the organization’s gala. And it’s nice for the volunteers, too. I take my late lunch with Kathleen the hallway. By now Anna is back from a shower. Susie, perhaps two years oaf age, has shown up in one of those rolling rings. John, who looks like he’s in his early teens but is in his 20s, continues to rest in his wheelchair. Kathleen sits in a chair, keeping an eye on all three while Anna and I keep talking movies and dogs. Then Kathleen gently laughs. “Susie’s blowing kisses.” The child silently smacks her lips at Kathleen. I laugh, and the girl turns to me – so I play the game as well, smacking my lips. The sweetest moment is the delay – the second or two that passes before the child deigns to return the favor. It’s her sole gesture of connection to me, rising out of a mysterious world she, as of now anyway, cannot put into words. Maybe she never will. I strive to let myself go further and further into this moment – just the three kids, and Kathleen, and the nurse behind a nearby counter. It is, indeed, profound and joyful, and, even though I don’t have kids, I can imagine doing this and even, once hooked, needing to do this. But then, almost five hours into my visit, something welling up inside, tells me it’s time to go. Following the example of the George Mark volunteers, I manage to screen out the sadness long enough to write notes at a Starbucks and do my clothes at a coin-op called Laundry Land, where a guy named Julio distracts me with his story, one of being an immigrant and having a family here that his mother down in Mexico can’t come visit. His story, touching as it is, is actually a relief. But soon Julio is gone, and my clothes are done, and in the parking lot, even as I’m stuffing my clean clothes into the trunk, it all catches up to me. The homeless in San Francisco yesterday, the children today. Something splits open. Like the little girl, I can’t put what I’m feeling into words. One of those times when pain and numbness seem to coexist, even conspire, taking you into a fog. The world around me seems changed, even strange. Knowing I’m useless for the evening, I retreat to the familiar in an unfamiliar town – I go see a movie. I get a ticket for a comedy, but as I buy my popcorn, I keep hearing Anna’s voice. I decide to see if she’s right, even if that means going back for the 3D glasses and taking in the Transformers in all their 17-percent approval rating glory. This time I see what she means, and I see why she likes it. In this world, the evil and the good are clearly defined, their actions logical and obvious. The opposite of the inexplicable threats of genes and nature and random chance, the pain inflicted on kids like herself for no reason at all. Driving past George Mark Children’s House the next morning on way out of town, I want to swing up the lane and give Anna a sneak preview. Then I remember: She was scheduled to go home last night.